Analytical results of a series of poly(N-isopropylacrylamide) (PNiPA) with different tacticities using infrared spectroscopy are presented for studying the influence of the solvation and molecular interactions between the polymeric chains. Infrared spectra of solid matter samples of the compounds exhibit a systematic band intensity change for three band components at 1,680, 1,659, and 1,628 cm−1 involved in the amide I band. The three components correspond to the free, half, and full hydrogen bondings of the secondary amide group, which reflect the molecular configuration depending on the tacticity. 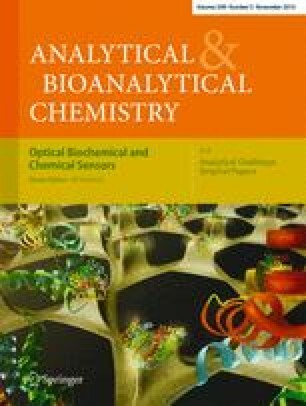 When cast films of the compounds prepared on a solid surface are analyzed by infrared transmission spectrometry, another factor of the solvent used for the film preparation is found to be another factor which plays an important role in determining the molecular architecture in the films. This molecular imprint mechanism after the solvation is confirmed by measuring infrared multiple-angle incidence resolution spectra of annealed films. The molecular interactions in the polymeric samples have been revealed by the use of infrared spectroscopy and the tacticity-controlled samples. The online version of this article (doi: 10.1007/s00216-010-4113-x) contains supplementary material, which is available to authorized users. This work was financially supported by Grant-in-Aid for Scientific Research (B) (TH: no. 20350035), Young Scientists (B) (YK: no. 21750126), and Priority Areas (TH: no. 21020012) from the Ministry of Education, Science, Sports, Culture, and Technology, Japan, and also by Iketani Science and Technology Foundation (TH and YK), Japan, to whom the authors’ great thanks are due.